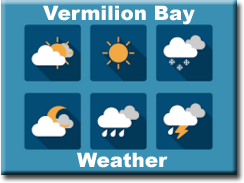 Directions: From International Falls take Highway 11 east (20 miles), north on Highway 502 (90 miles), east into Dryden (6 miles), west on Highway 17 to Vermilion Bay (24 miles), north on Highway 647 (18 miles) to the lodge. We accept US credit cards, cash or checks. We now have Interac at the lodge for Canadian debit cards only.